Every week I pay my £35 odd for a weekly travel card to zones 1-2. Buy my calculation I think I’m owed about £12 of that back for the amount of times the bloody thing shuts down. Earlier this week I was denied a quick journey home ( for quick-see 40min) as we were informed that Victoria line trains would not be running from Warren Street. Well thanks. Guess I’ll go the extra special 20 min out of my way route and take a bus. Also thank you for making sure that the information stays well clear of your website. It was later that night as I was checking my route for tomorrow that I found that Warren streets Victoria line was closed due to faulty escalators. I would love to know why this was deemed a suitable reason to shut a tube train when, last time I checked, the running of them has very little to do with their use of motorised steps. If it was the fact that the escalators leading to the platform were faulty then I’m still puzzled. 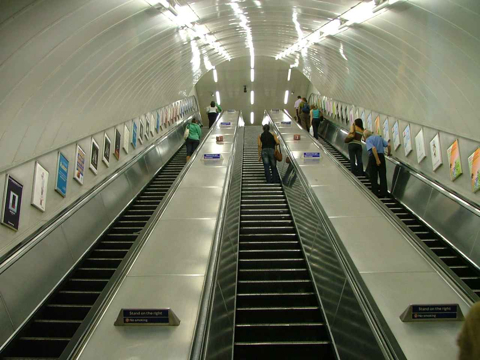 The wonderful thing about escalators is that if you turn them off the magically transform into “stairs”. This method of changing from high ground > low ground and visa versa has been popular for a fair few centuries now. But I digress- I write this as I am packed onto a crowded overground train bound for kings cross. Actually it’s going quicker than I thought- either that or this rant has been a distraction from time. Anyhow my tanks to TFL for shutting my tube lines and taking my money. Now I’m off to the nearest street corner to find a soap box to stand on. P.s I am now on a Victoria line train and have just heard that Warren Streets escalators are STILL not working. Workshy.